Join us tomorrow, Saturday, June 25, for a refreshing Shabbat morning service, sprinkled with beautiful Chassidic melodies, interesting insights into the prayers and a brief discussion on the weekly Torah portion. Our very own Rabbi Yitzchok Schmukler has once again been invited to deliver the invocation at the start of the League City Council Meeting. The meeting, which is open to the public, is scheduled for this Tuesday night, 6:00 pm, at council chambers located at 200 W. Walker St., League City. The holiday of Shavuot begins this Saturday night and concludes on Monday after dark. Shavuot comes 49 days after the first day of Passover and marks the anniversary of the giving of the Torah at Mount Sinai, 3,328 years ago. It is observed in the same manner as the other biblical festivals, with candle lighting (times below - be sure to light from an existing flame) at the eve of each of the two days, synagogue services with special Torah readings and festive meals. 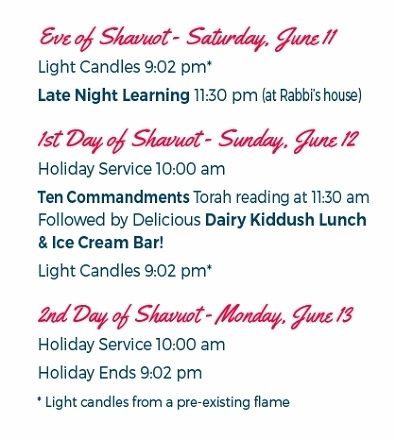 Some of the highlights of Shavuot include staying up all night studying Torah on the first night, the reading of the Ten Commandments on the first day and enjoying dairy delights. Sunday: Ten Commandments & Delicious Lunch! 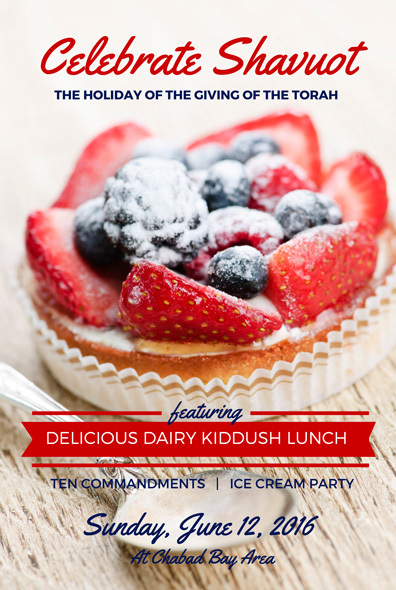 Featuring: A delicious dairy kiddush lunch, traditional reading of the Ten Commandments and an ice cream party for kids of all ages! Followed by Delicious Dairy Kiddush Lunch & Ice Cream Bar!